There's my new favorite set, Flower Patch! Love doing the 2-step stamping with the photopolymer stamps--you can see EXACTLY where you're stamping, for the perfect layered flower!! Hope you'll all play along with us!! Can't wait to see what you come up with!!!! Some fun projects from June!! Here are a few of the cards we made in June at my Club meetings!!! Enjoy! Please visit MyPaperPumpkin.com to join. Hi!! I can't believe we're almost to 100!!! WOW! That's alot of challenges--thanks to everyone that plays along with us each week! We truly love to see all the great art you share! Be sure to head on over to the Nacho Blog to play along again!!! I used the Blooming with Kindness Stamp Set, along with the Back to Black Designer Paper! I stocked up on it with the Buy 3, Get 1 Free promotion, so hope you don't get tired of seeing it! :-) Colors are Real Red, Basic Black and Whisper White. I added some embossing with the Big Shot on my Real Red strip--for a bit of interest! Enjoy!!! Mary Rothmeyer!!! Congrats, Mary--you get to pick $25 worth of FREE stuff!!! Thanks to everyone that placed an order!! Another one for AAA Cards!! 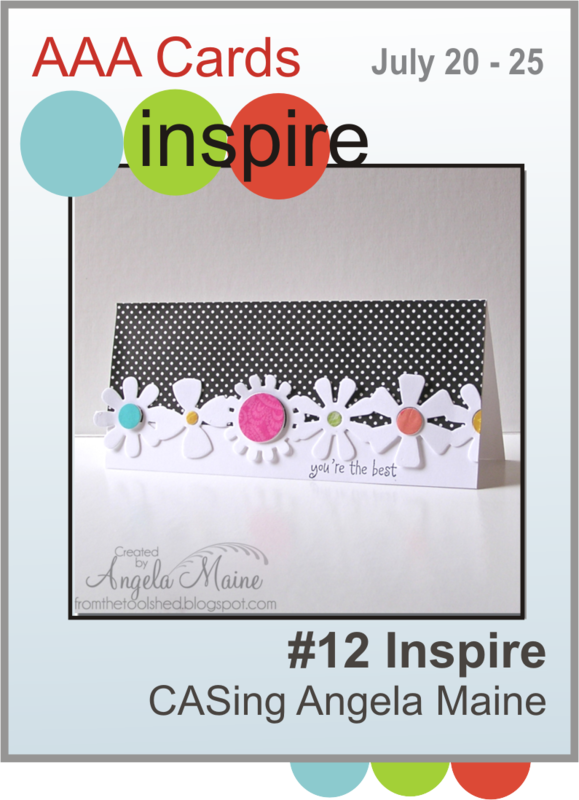 I love all the black and white patterns in the pack--so fun and easy to use! I paired it with the Flower Patch stamp set and Flower Fair Framelits. I love the simplicity! Oh, and the colors are Basic Black, Whisper White and Strawberry Slush! Have a GREAT day! I'm in the middle of my stamp-a-stack weekend!! My first "official" classes of 2014!!! It's been a blast catching up with everyone!! Thanks to all coming--I appreciate your continued support and loyalty!! This was such an easy card to make! Just score your cardstock across and up/down to create a square grid. Then, stamp away!! You can see how the scoring creates "grout lines"!! Simple and pretty! !